Rugged and beautiful day boat! Two rows of mains'l reef points and lazy jacks fitted as standard. Furling heads'l and Tufnol blocks with polyester braided running rigging. Hull Coppercoated by Dale Sailing Co. 2017 so no need for annual antifouling! Character Boats, as the name implies, build modern GRP replicas of small wooden craft from a by-gone era, in this instance the Post Boat which served the communities around Loch Broom, Ullapool, early in the last century. Built to the highest of GRP mouldings standard near Lytham St Annes and with varnished hard wood trim, these boats simply ooze character and gain admiring looks wherever they are taken. And 'taking' is the essence surely, for a trailer sailer? As important in this context as the quality of the boat itself is the ease of trailing and rigging. 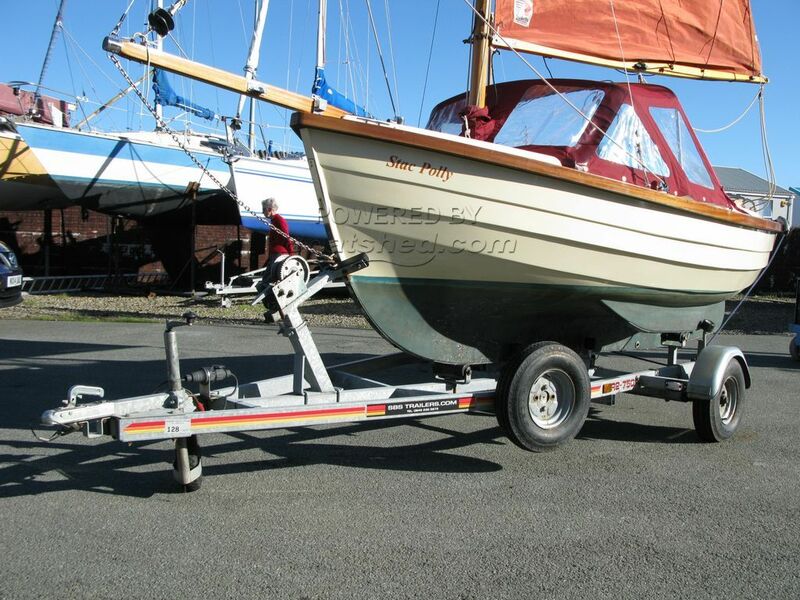 The custom built trailer provided and the well planned gaff sloop rig are designed to take the strain out of this particular evolution. Ideal for summer family picnics in secluded bays or shallow creeks the Post Boat is certified as RCD Category C for 5 persons. This barely two year old example is, along with trailer and motor, offered for sale at less than half the price of a new one. If it's a superb day boat with a characterful difference that you are looking for, well, you might just have found her! This Character Boats - Post Boat has been personally photographed and viewed by Alan of Boatshed Wales. Click here for contact details.